Welcome to Chapter Five, the world of macromolecules. Chapter Five will teach everything you could possibly want to know about macromolecules. It begins by explaining how they are built, in general terms, and how they are dissembled. The rest of the chapter talks about the individual properties of the monomers and the many functions of the overall macromolecules. The four classes are Carbohydrates, Lipids, Proteins, and Amino Acids. First, we will start out with tips for the entire course. The three main things to remember are Notes, Self Quizzes, Flash Cards. Notes is making sure that in class you take minimal notes and take more in depth notes at home as you read the chapter, use Mrs. Squires' notes as a reading guide. Self Quizzes! Self Quizzes! Self Quizzes! The secret is that Mrs. Squires often takes quizzes from the self quizzes in your book at the end of each chapter, so ALWAYS DO THEM AND YOU'LL DO GREAT! That's why we have the self quiz for Chapter 5 right here on this site. Flash cards are also essential, especially for key terms. Some times the key terms can give you just as good idea of a chapter as a summary, and we have a list of key terms for this chapter on this site as well. Second, we want to give you the two main points to focus on when trying to understand this chapter. First, a good way to organize this information is to remember that it is four parts of one whole. Each class of macromolecule is still a macromolecule. Therefore, make a table contrasting them. It should tell the monomers, the structure, and function of each class, including examples of each with explanations of the specialized functions of each (such as starch for carbohydrates). 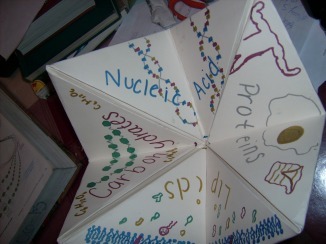 The other idea is to make a fortune teller (seen below). Each flap will have a separate class of macromolecule, and under each fit as much details about each class as possible and use it to test yourself later. Follow these instructions and this chapter will be a breeze! Macromolecules are giant molecules made up of smaller units called monomers. Monomers are bound together by a dehydration reaction and are split by hydrolysis. One class of macromolecule is Carbohydrates. These molecules have sugars for monomers and function in storage and structure. Plants have starch and cellulose, animals have gylcogen and chitin. Macromolecules called Lipids are hydrophobic molecules that can be fats, phospholipids or steroids. Fats are made of glycogen and fatty acids and function in insulation and storage. Phospholipids are a hydophillic head molecule with two fatty acid tails and are found in cell membranes. Steroids like cholesteral keep the membrane fluid. Another class of macromolecules is Proteins. Proteins are diverse molecules made up of amino acids that can function in many things including speeding up chemical reactions, structural support, storage, transport, cellular communications, movement, and defense. There are four levels of protein structure. The final class of macromolecule is Nucleic Acids. Nucleic Acids are the genetic material and are made up of nucleotides. The two types of nucleic acids are DNA and RNA.